As I get more into cookery, I can’t resist a brief note regarding my latest culinary achievement. Of all dishes known to country folk, jugged hare has to be the most vaunted and notorious. Everybody has a take on the old-fashioned recipe, and if you know nothing else about the process involved in “jugging”, you probably know that it involves a great deal of blood. This little detail is enough to either titillate or repulse the huge majority of would-be hare-juggers, but having given it a go last night, I am actually rather impressed with the recipe. To begin the process, I “caught my hare”. As I walked through a stubble field in Norfolk, the beast rose up like a beige spectre at my feet and coursed off through the dead stalks with a crackle. 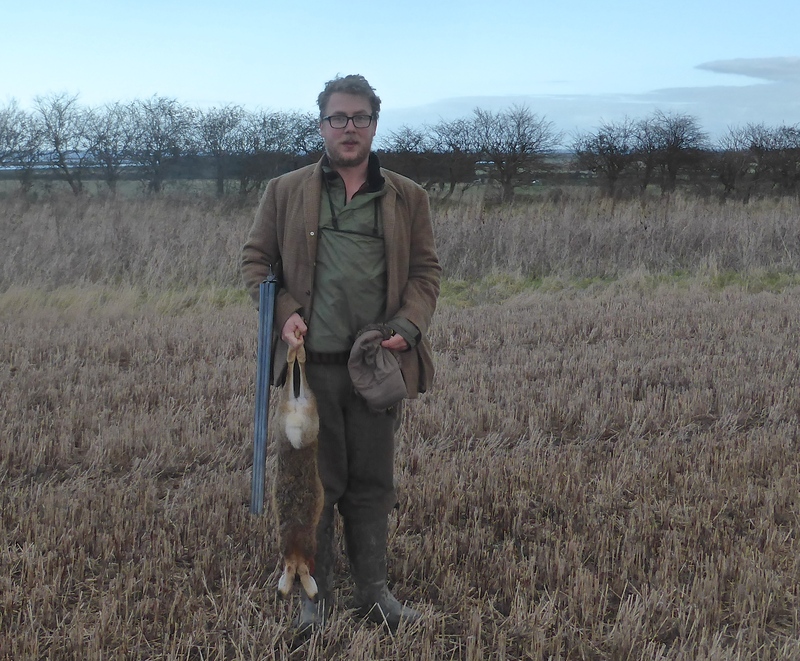 I wanted a hare specifically to try “jugging”, and his black-tipped ears flicked and turned as he soared over the remains of the crop just thirty yards away. The shot spun him to an abrupt somersault. So far, so good. The question was then raised as to how I would extract the blood from the hare while it was still warm. I tried to bleed him into a bag offered by my host, but after a dribble of blood had run out, it emerged that the bag was leaking. The bag was transferred to a tub and then the chest cavity drained with an abrupt “gollop” of blood to the tune of about half a cupful. This had been an extremely messy process which only got worse as, having opened the floodgates, the hare then bled all over the back of the pickup, down the back door and all over me. As soon as I got home, I dug a recipe online from an American website – http://honest-food.net/2008/12/30/classic-civet-of-hare/ This was by no means the most straightforward recipe, but it had a reassuring complexity that I found quite encouraging. As it turned out, this was quite the most challenging piece of cooking I have ever tried. For a start, it took several hours of hands-on labour to get the pieces together in the right order, and like so many older recipes, it called for minute quantities of dozens of very specific ingredients. It was an eye-opening experience to see just how simple and stripped-down modern cookery is by comparison. With half an hour to go, I poured the blood and the liver into the blender and pushed the button. Rather than descend into a foul festival of gore, the resulting juice was actually quite pleasing. It was slowly stirred into the stew and had the miraculous effect of thickening it into an extremely satisfying consistency – the protein in the blood cooked like the white of an egg, binding the whole thing together and creating a gloopy, appealing casserole which smelt of red wine, dark meat and onions. Sure enough, it was delicious – perhaps not so much more delicious than a beef casserole that could have been made in one fifth of the time, but certainly a respectable dish. On a slightly personal note, the hare was so rich that it would have been difficult to have eaten more than a modest plateful, and the house rang to the sound of bubbling tums well into the night. In terms of a piece of sporting, culinary history, it would be hard to beat a jugged hare. A single hare produced enough stew to feed eight people, and the work that went into building this edible monument felt like a fitting tribute to a fine beast. I don’t feel compelled to eat jugged hare every night of my life, but it was certainly a worthwhile experience. I had an email yesterday from WordPress (this blog’s publisher) to let me know that I have been writing Working for Grouse for five years. During that time, I have seen the visitor statistics rise month on month – amazingly, hundreds of thousands of people have come to read about the Chayne from across the world. Despite having made no real attempt to publicise it, I have created a monster – and I have my friends and well-wishers to thank for it. People sometimes ask why I bother writing a blog – I work as a writer, and surely the last thing I want to do at the end of the day is sit down and write some more. The truth is that I love writing it, and it has put me in touch with a fantastic range of people who have become good friends over the last few years. If I was sufficiently nimble-witted, I could probably find some way to make some money out of Working for Grouse, but that doesn’t really feel like the point of the blog. It is an absolute labour of love, and I am delighted that it has given so many people so much pleasure over the last few years. Blackgame have fallen to the bottom of the list in terms of subject matter over the past few weeks, but make no mistake – they have not fallen off the list of my priorities. As the spring comes on, the boys in blue will come back to the forefront. 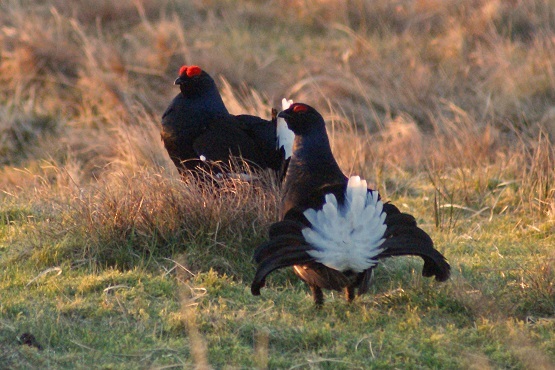 So watch this space for 2015, and thank you everyone for a fantastic start to Working for Grouse! 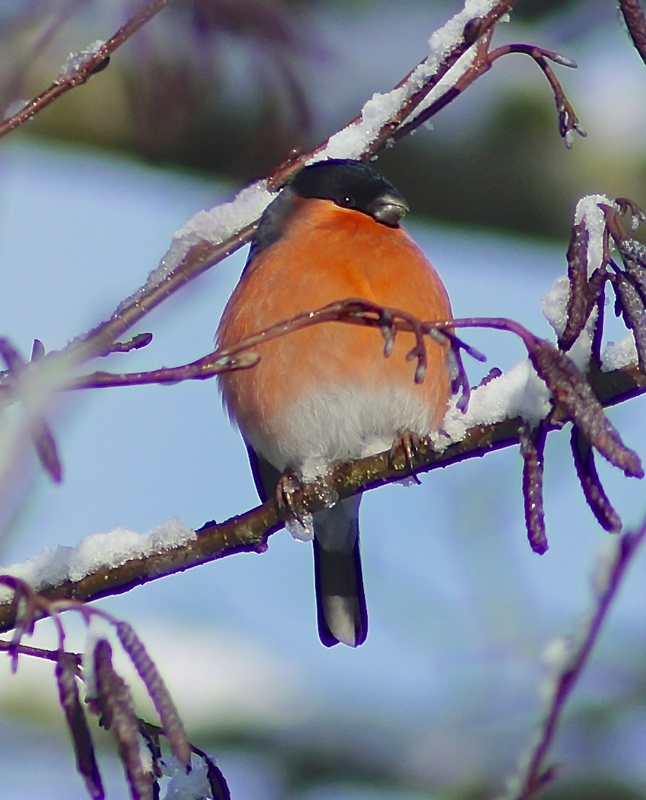 Worth posting a couple of pictures from the last twenty four hours of heavy snow in Dumfries and Galloway. Despite falling with the kind of intensity that would make a Canadian cower, none of this wonderful white stuff seems to be settling with much enthusiasm, and the flurries are interspersed with extended periods of gloomy dripping. There is an enormous amount of snow lying up in the hills, and it may now be several days before I can get up to the Chayne. As much as I feel a little downcast about the weather, it is perhaps not the worst thing to be stuck downhill on the last few days of the season, particularly given the sudden influx of wigeon down on the merse. I had a chance to experiment with a few different non-toxic loads while wildfowling over the weekend. As it turned out, I was seriously impressed with some of the cartridges I tried, particularly those loaded with Hevi-Shot which I splashed out on at considerable expense (£23.50 for ten of Lyalvale’s finest). 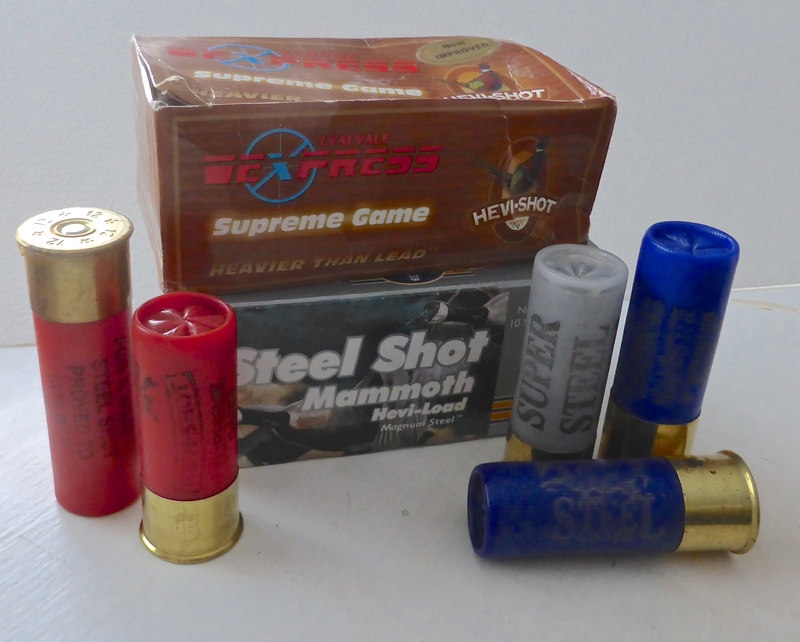 Getting hold of non-toxic cartridges which can be fired through my favourite 1938 BSA shotgun is not an easy task, and these Hevi-Shots were actually the first 2 1/2″ non-toxic cartridges I’ve ever been able to get my hands on. Shooting wildfowl normally means that I have to use my 3″ Savage pump action, which is a trusty piece of kit but totally lacks any refinement or class. The Savage spits out any non-toxic cartridge I choose to load it with, but it made a very pleasant change to let loose some Hevi-Shot at a spring of teal with my BSA – a fitting weapon for a fine quarry. Down they came, and how much more pleasing to break the side by side and plop more cartridges in than work the rattly pump in the aftermath. It is difficult to convey the significance of one gun over another to someone who has no interest in shooting, particularly when the popular perception of the sport regards it as the straightforward process of blasting birds out of the sky. As I understand it, some types of car are considered to be better than others, but they’re all just ways of getting from A to B as far as I’m concerned. 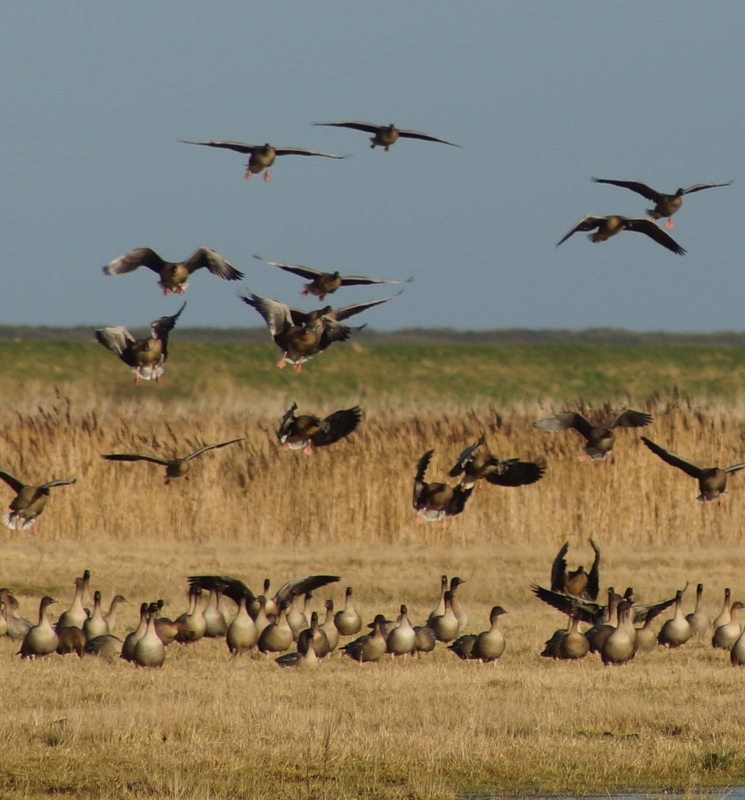 I don’t shoot nearly enough wildfowl to hold a qualified opinion on which shot is best, but I will say that I was very impressed with Gamebore’s 3″ Mammoth steel shot cartridges, which clattered into a skein of greylags with delight. There was no arguing with the hearty crack of shot on feather, and as the dark shapes fell out of the blue dusk more than forty yards away, I would have struggled to have told the difference between steel and any other metal. 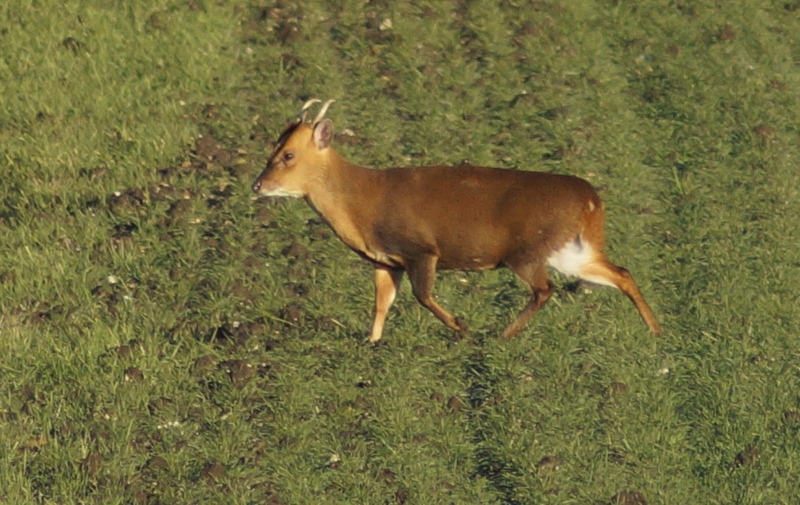 I don’t think I’ll ever get used to seeing muntjac. The stocky little beasts are more like pigs than deer, and as much as I enjoy shooting them, there is something vaguely surreal about finding them roaming free in the British countryside. Even when they are settled and calm, they dart around like insects, scuttling between mouthfuls of food and rotating their pink, shell-like ears. We saw a particularly fine buck when I was down in Norfolk, and there was something disarmingly appealing about him as he browsed through the field in the sunlight to the tune of grey partridges. Despite all the dung flung at them by foresters and farmers, I like these deer, just as I would secretly admire any species that dares to confront man’s total intolerance of any inconvenience posed by nature. I quite understand that they are a pest, but there is a real charm to them. Seeing one flee from cover in a sunken carr, I laughed out loud at his ludicrous gait and his expression of grave and concentrated sauciness. As it happened, I was lucky enough to shoot two young deer when I was down, and having shared the spoils with a friend, I now look forward to the much vaunted venison. Muntjac is a delicious meat, but I can’t put my hand on my heart and say that it is better than roe. While staying down South, I saw my first Chinese Water Deer. It was a momentary glimpse before it vanished into the beets, but I was left with the impression of a miniature pantomime horse mingled in part with a plush teddy bear. These deer certainly warrant much closer investigation with both camera and rifle, and I hope to be able to write more about them in due course. Having just returned from Norfolk after a busy couple of days spent chasing muntjac, flighting geese and watching birds, I now have quite a stack of work to catch up on. However, suffice it to say just now that I am ever more in awe of the North Norfolk coast and all that it has to offer the avid wildfowler and birdwatcher. Each time I head down, I’m certain that the trip will never match the previous year, and each time I find that it somehow improves upon it. After the evening flight last night, I came up the A1 with a sack of geese and an absolute treasure trove of new memories. Some of the latter will appear on here in the next few days, but there is probably too much to set down in full beyond the confines of my notes and diaries. An extraordinary trip, and unquestionably the highlight of the year. After six days under snow, the hill has wound down to a state of almost total inactivity. Ravens clock and roll in the highest blue, but aside from the odd wren and stonechat in the heather, the only visible birds are the kestrels, which appear to be almost impervious to the cold. 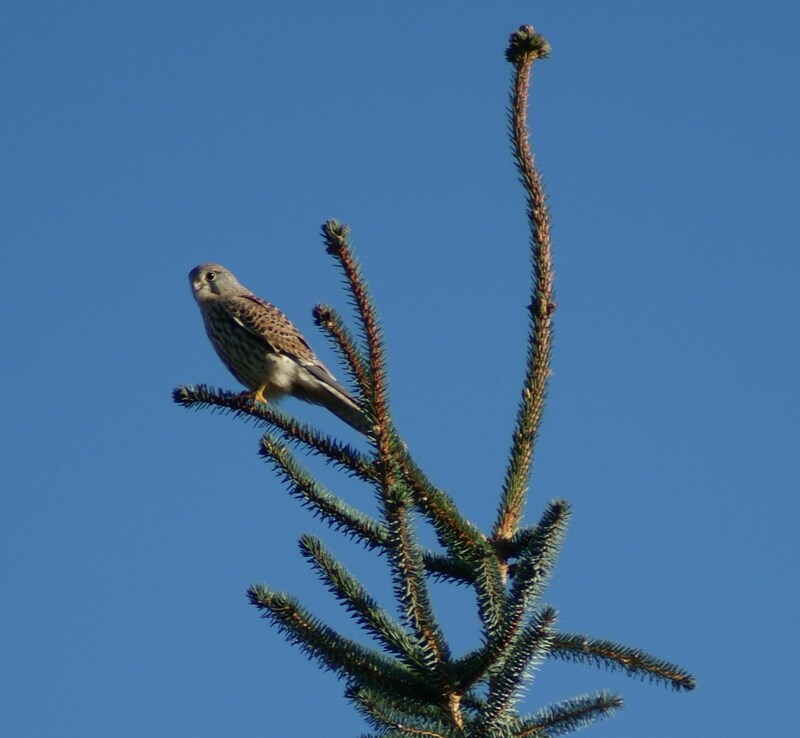 The local kestrels did very well during the summer of 2014 (as did anything with a penchant for eating voles), and by the end of August it was not uncommon to see half a dozen hunting at a time. The harriers all hooked off overnight at the start of the month when the cold weather came on all of a sudden, and it has now been a fortnight since I last saw a bird on my ground. There was a ringtail hunting down on the merse on Friday, but it is alway mild in the saltings and there are many more chances down there to catch a snipe or a redshank than up on the barren tops. I knew that the harriers would be put off the hill by a bit of cold, but this wholesale abandonment of their winter quarters has been surprisingly abrupt. Perhaps they only stayed because it had been so mild until that point, but the fact that the kestrels remain suggests that it wasn’t a lack of food which saw them off. I can only conclude that the little falcons are altogether hardier than their foppish counterparts. The relationship between harriers and kestrels was not all plain sailing when they shared the hill, and I saw harriers attacking kestrels and stealing their meat on several occasions. They had a strange relationship founded on mischief and bullying, but I never saw any real animosity between the two. In fact, kestrels attacked harriers as frequently as vice versa, and there was a certain “brothers in arms” camaraderie between two birds sharing an apparently inexhaustible supply of voles. Now that the snow is down, it must be harder work to catch those rodents, but the kestrels appear not to care. They still leave little mounds of fluff on their favoured plucking posts, and it is interesting to see the delicacy with which they remove the gall bladder of their prey and leave it to blow dry in the wind. They seem to have a particular aversion to eating the nose and bottom jaws of the voles they kill, and these disembodied whiskery bits are often found on well used post tops or cairns. Although merlins seem to catch fewer voles, they have been hunting on the hill since the New Year, and I see that they also have the habit of removing the bottom jaw before swallowing the skull. There are still some pipits and buntings lurking in the rushes, and I daresay the presence of these little birds is enough to tempt a merlin uphill when logic dictates that it would be more sensible to head for the reed beds of the Solway.